Dr. Mark E. Richards discusses the innovative benefits of form-stable cohesive gel implants and touches upon candidacy requirements. Washington, DC— Breast augmentation remains the most popular cosmetic procedure in the nation, according to recent statistics gathered by the American Society of Plastic Surgeons. Dr. Mark E. Richards, a plastic surgeon in Washington, DC, says that patients will likely continue to desire fuller, shapelier breasts, and typically they also will want natural looking and feeling results. Therefore, he explains, breast implant manufacturers have endeavored to develop increasingly natural appearing implants with lowered risks in response to patient demands. The cohesive gel implant, commonly called the gummy bear implant, is one of the latest innovations in this field. He goes on to state that these advanced designs often can deliver remarkable benefits. Cohesive gel implants are designed to retain their shape, making them unique among breast implant types, Dr. Richards indicates. He explains that the silicone filling inside the implant shell is thicker than traditional silicone implants, which can lend a slightly denser, more natural feel and appearance to the augmented breast. Other benefits of gummy bear implants, he notes, may include the reduced risk of several concerns that potentially occur as a result of breast enhancement, including rippling, capsular contracture, and implant leakage. The Washington, DC plastic surgeon suggests that as patients become more educated about the breast enlargement process, they often seek an implant that can provide a beautiful natural appearing outcome with minimal complications. In many cases, he says, the cohesive gel implant can deliver on these complex desires. Furthermore, he explains these implants have been shown to give good results in selected patients even when placed above the muscle, thus avoiding deformation during contraction of chest muscle that is common to sub-muscular implants. 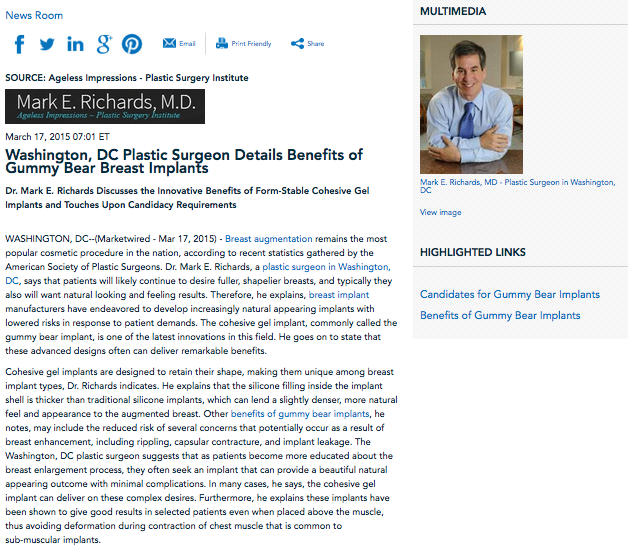 Breast augmentation and, more specifically, the gummy bear implant is not appropriate for every patient, Dr. Richards explains. Candidates for the cohesive gel implant will be in good health, over the age of 22 years, and have reasonable expectations for results, he adds. Furthermore, he says that women who prefer naturally produced substances to artificial materials may elect to have saline implants rather than silicone, the latter of which the gummy bear is comprised. Eligibility for gummy bear implants can be determined during a consultation with a plastic surgeon, and he emphasizes the importance of researching a physician with board certification and extensive experience with this product and procedure. Ultimately, Dr. Richards believes that cohesive gel implants can be an excellent option for qualified candidates seeking breast enhancement. With the multitude of potential benefits, typically including safer, more aesthetically appealing results, he says many of the hundreds of thousands of women who receive breast augmentation each year likely will opt for gummy bear implants. Certified by the American Board of Plastic Surgery and the founder of Ageless Impressions – Plastic Surgery Institute, Dr. Richards is a plastic surgeon practicing for 25 years in the Washington, DC, Maryland, and Northern Virginia area. He was educated at Yale University and the University of Maryland School of Medicine before undertaking seven years of additional training in general and plastic surgery. An advocate of continued medical education (CME), he is also the recipient of numerous accolades, including being voted Top Doctor by the U.S. New & World Report. Additionally, he is an active member of several esteemed medical associations, serving as President of the Montgomery County Medical Society and the National Capital Society of Plastic Surgeons, a chapter of the American Society of Plastic Surgeons. Dr. Richards is available for interview upon request.